Islam, Christianity and Israel in the Last Days. The modern revival of fanitical Islam, fueled by unrestrained nationalistic fervor, is the most dangerous force in the world. It is threatening our Judeo-Christian civilization with the murderous cry, "Today we fight the Saturday people, tomorrow the Sunday people" Discover pre-Islam Arabia, the life and teachings of Mohammed and the mysterous "seal of the prophet." Learn the difference between Islam and Christianity, the Koran and the Bible and different Islamic sects.Study Middle East myths and how the news media uses them to influence world opinion and our thinking. 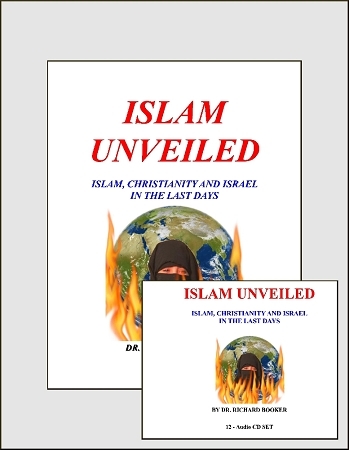 Learn why Christians must stand with Israel and what God expects of Christians believers.Understand the relationship between Islam, Christianity and Israel in the last days and what this might mean for your life.